Milwaukee AIA celebrated its 40th anniversary in 2008—as the saying goes, bigger and better than ever. We began as a gleam in the eye of Dr. Stephan F. Borhegyi, an energetic Mayan archaeologist who was Director of Milwaukee Public Museum during the 1960s. With assistance from the Friends of the Museum, itself organized not long earlier, Borhegyi pitched the value of affiliation with AIA to Friends who had expressed interest in archaeology, and to area professionals. Moving Milwaukee Public Museum from its quarters in Central Public Library to its present building occupied much of Borhegyi’s time in 1964 and 1965. Once settled, he contacted Dr. Emmett L. Bennett, Jr, of UW-Madison about reconstituting a Wisconsin Society of the AIA, one of the first affiliates (1889) of the AIA after its founding in 1879. Dr. Bennett proposed Milwaukee become a branch of the already existing Madison chapter, but secondary status was never Borhegyi’s preference. By 1967, Borhegyi had recruited nearly double the minimum 25 members to start an AIA chapter, and the National AIA granted us official chapter status at its December Annual Meeting. Tragically, Borhegyi died in an automobile accident on I-43 downtown in September, 1969. Our first president was Mrs. Thomas F. Fifield, a civic-minded River Hills resident who remained a member until her death in 2003. Vice-Presidents were two academics, art patron Dr. John Pick, a professor in Marquette’s English Department, and Dr. Robert Ross of UWM’s Classics Department. Dr. Ross and his wife, Miriam Ross, carried out much of the business of the chapter into the 1970s. Dr. Sidney Goldstein of UWM’s Art History Department served as chapter secretary in the early 1970s, until he became Curator of Ancient Glass at the Corning Museum of Glass in upstate New York. 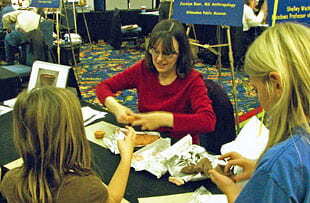 Membership in the Milwaukee Society has always been a mix of professional archaeologists, students and avocational members—members of the community interested in learning about archaeology and interacting with professionals. Both academics and avocationals have been leaders of Milwaukee AIA. 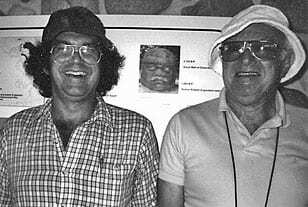 Among the former were Dr. Rudolph Dornemann, curator of Near and Middle Eastern archaeology at Milwaukee Public Museum in the 1970s, and his successor, Carter Lupton, now Section Head of Anthropology and History. Among our avocational leaders were Virginia Read, John Ebersol, Teresa Weber, and most outstandingly, the late George Morse. George Morse was a founding member, treasurer, publicity officer, president 1971-1973 and a donor ($60, for example, in 1973), always a regular in the audience, and by coincidence (really! ), father-in-law of Jane Waldbaum. 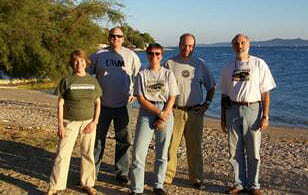 Milwaukee Society members in Zadar, Croatia, September 2007. In recent years, AIA-Milwaukee has been led by academic archaeologists including Jane Waldbaum, professor emerita of Art History, UWM, who went on to become national AIA president (2003-2007), Bettina Arnold of the UWM Anthropology Department, Derek Counts and Andrea Stone of UWM Art History, and Jane Peterson and Alice Kehoe (professor emerita) from Marquette’s Anthropology Department. The varied interests and academic disciplines of our presidents, ranging from Germany to Jordan, Cyprus to Central America, reflect the broad interests of our membership and of the AIA lectures we host every year. In the past, lectures were held at Milwaukee Public Museum, Concordia College, and Marquette as well as at UWM. Now UWM, in partnership with the Art History and Anthropology Departments, provides space in Sabin Hall for our lectures and receptions. Back in 1967, AIA dues were $15 and included a subscription to Archaeology Magazine. The National AIA office sent us $50 to start us off, and in our first year, 1968, we received $64.50 from them, including rebates for our members. Altogether, our income that year was $179.75, our expenses $140.80, and we have operated in the black ever since! Each year most of our operating budget comes from rebates on national membership dues, and sometimes on “luck of the draw” as we won the AIA’s local society lecture lottery for 2009-2010 resulting in a jackpot of over $800 for the year! We also happily receive modest donations from members to supplement this income or to cover special projects (gifts to AIA are tax-deductible). Our most delicious donation came in 2004 when we received a bequest from one of our faithful and enthusiastic members, Helen Bernstein, to cover expenses for refreshments for twenty years! Helen regularly brought carefully themed refreshments to our meetings—olives and pistachios for Middle East lectures, corn chips and chocolate for Maya—and among her last wishes was that her family create a fund to perpetuate her generosity. We sorely miss Helena’s insightful and stimulating questions after lectures, even as we enjoy her legacy at our informal receptions. Some other regulars who have passed away include Tula Erskine, George and Renata Morse, Gene Erasmus, Otto Heimler, and Pat Wagner. We miss them all. We grew to 75 members in 1978 and to slightly over 100 in 2007 and a few years before. We’ve had field trips, most often to Chicago museums for special exhibits, such as Pompeii and Tut in 2007, the Oriental Institute in 2008, and the Aztec World in 2009. Occasionally we have gotten together to visit Wisconsin archaeological sites. Sometimes we had membership parties to relieve winter doldrums. Our main activity has always been our lectures, each year bringing three archaeologists on tours organized by the national office, and three or four additional archaeologists that we recruit ourselves. Among the most famous have been Marija Gimbutas speaking on “Earliest Deities of Old Europe,” Lanny Bell and Mark Lehner on ancient Egypt, Stuart Struever (founder of Kampsville and Crow Canyon archaeological projects for avocationals), Mayanist Linda Schele, Paul Bahn on Palaeolithic cave painting and on Easter Island, and Lloyd Cotsen, who had been trained as a classical archaeologist but got an MBA, became CEO of Neutrogena Corporation, and endowed the Cotsen Institute for Archaeology at UCLA. Members of the Milwaukee Society have contributed to the national organization as well. Over the years we have produced several national lecturers including Andrea Stone, Derek Counts and Jane Waldbaum; Bettina Arnold, Jane Waldbaum, and Derek Counts have served on national AIA committees; student members Jocelyn Boor and Kevin Cullen have presented activities at the annual Archaeology Family Fair; and of course Waldbaum was recently president. In the “olden days” the local secretary and helpers spent afternoons sorting mailings by zipcode; now, in the digital age, UWM Web Master Homer Hruby created a handsome website for us, and we are building an e-mail list of members who would like to be notified quickly about our programs. As we enter our second 40 years, the AIA-Milwaukee Society remains healthy and vibrant. As always, our strength comes from our members. We welcome your participation and suggestions for improvement. We look forward to many more years of bringing the latest information about archaeology to our members and to the Milwaukee community through the AIA-Milwaukee Society.